We are still hung up on all the awesome architecture. 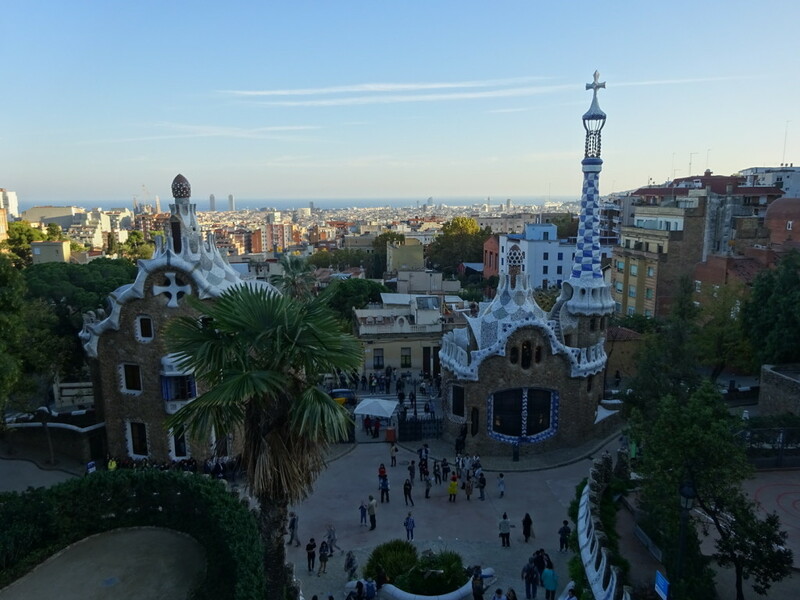 Barcelona is chock full of Gaudi and Gaudi-inspired creations as well as being home to an incredible amount of other art nouveau pieces. 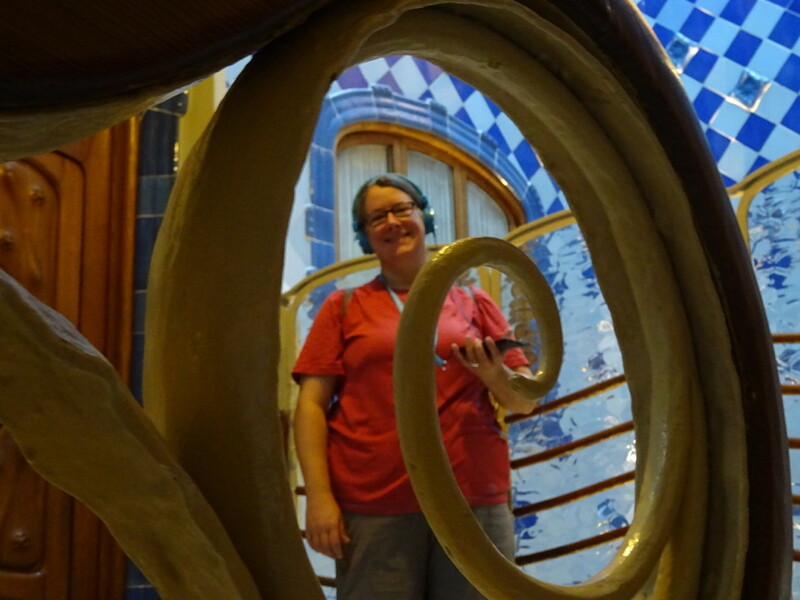 We went to Casa Battlo, Palau Guell and to Park Guell…all Gaudi. 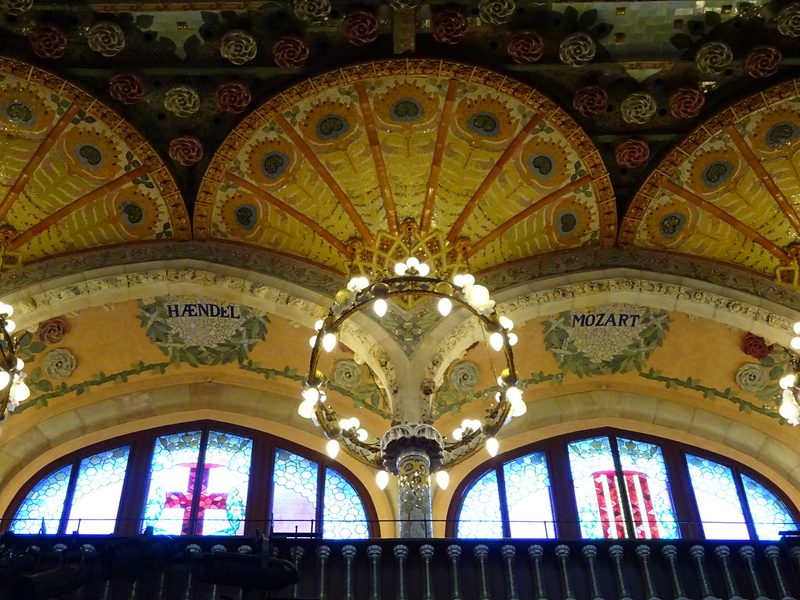 Plus we visited the incredible Palau de la Musica Catalana, not Gaudi, but still jaw-dropping. 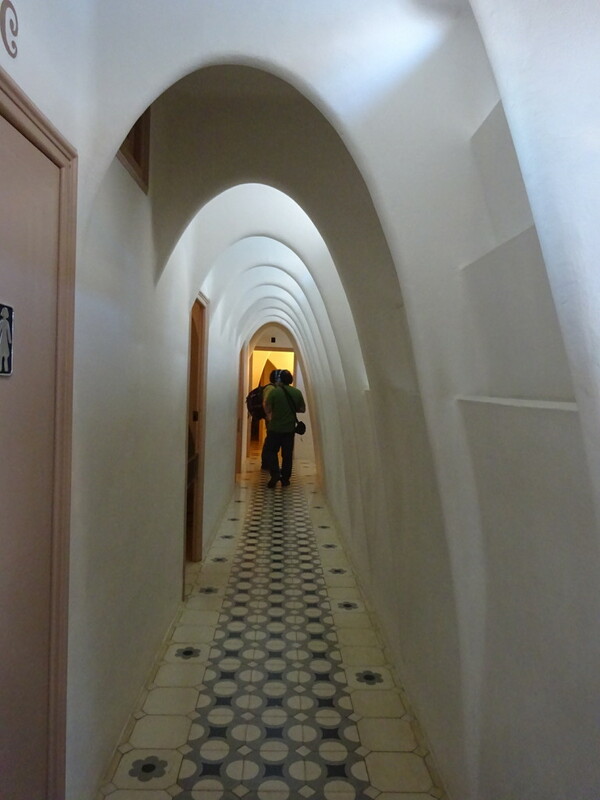 Ready for an amatuer tour of Barcelona’s flowing architecture? Grab your sunnies…here we go! Somehow, in addition to the Sagrada, Gaudi had time to design a number of other buildings around Barcelona. 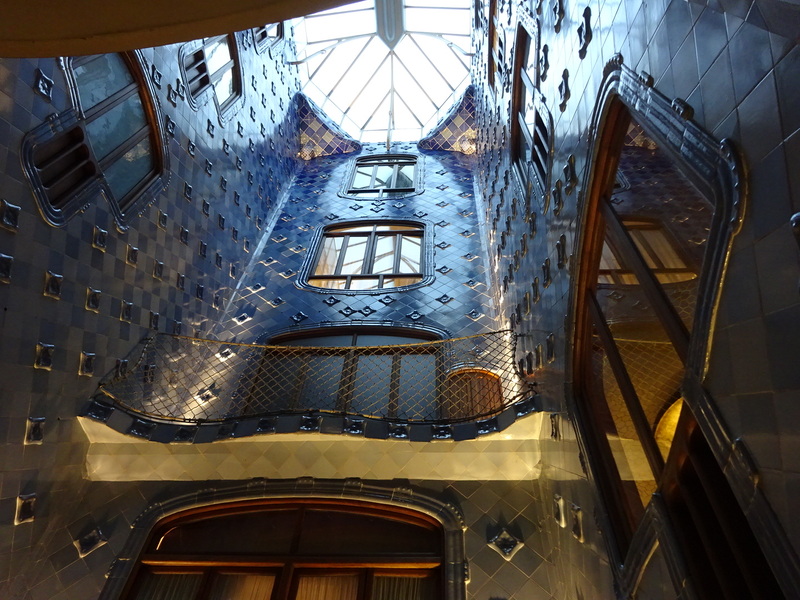 Casa Battlo was actually a massive home-remodel done in the early 1900’s. Locally it’s known as the ‘house of bones’ and it’s easy to see where it gets it’s nickname. 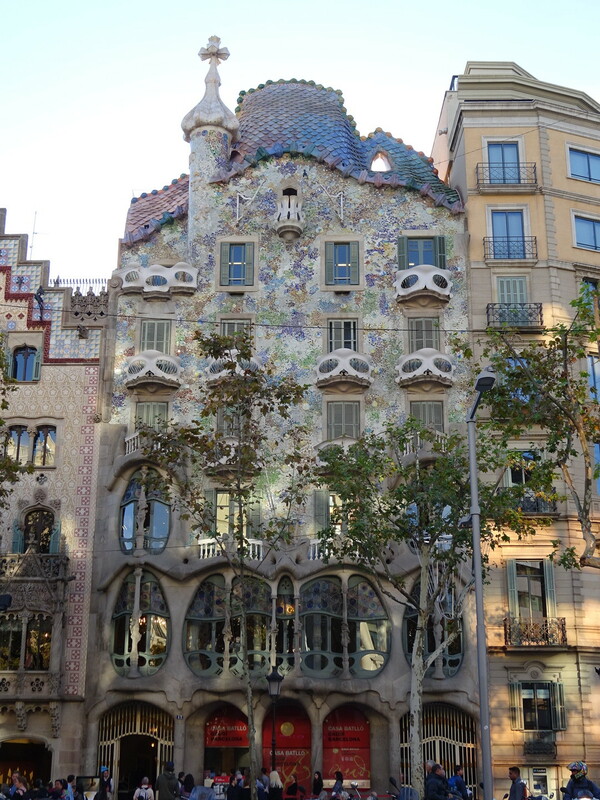 The exterior of Casa Battlo. 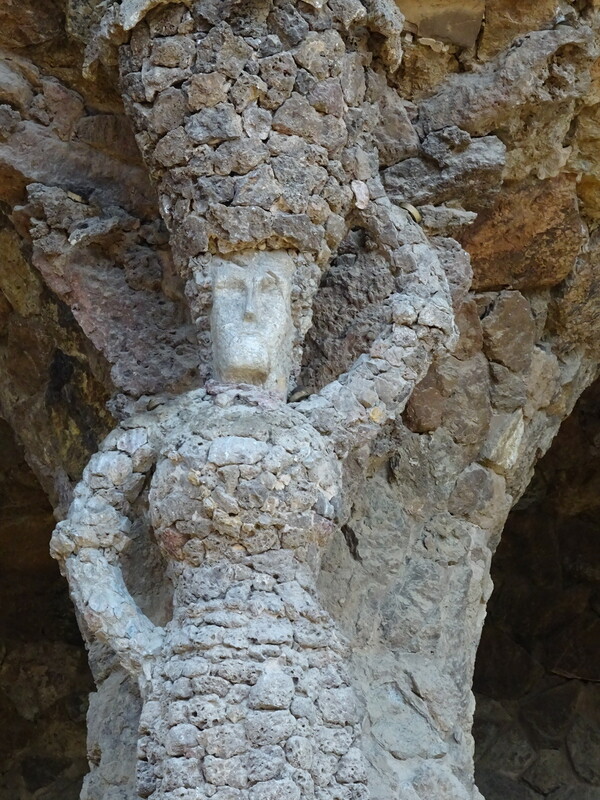 Dem bones, dem bones… I mean – look at that! 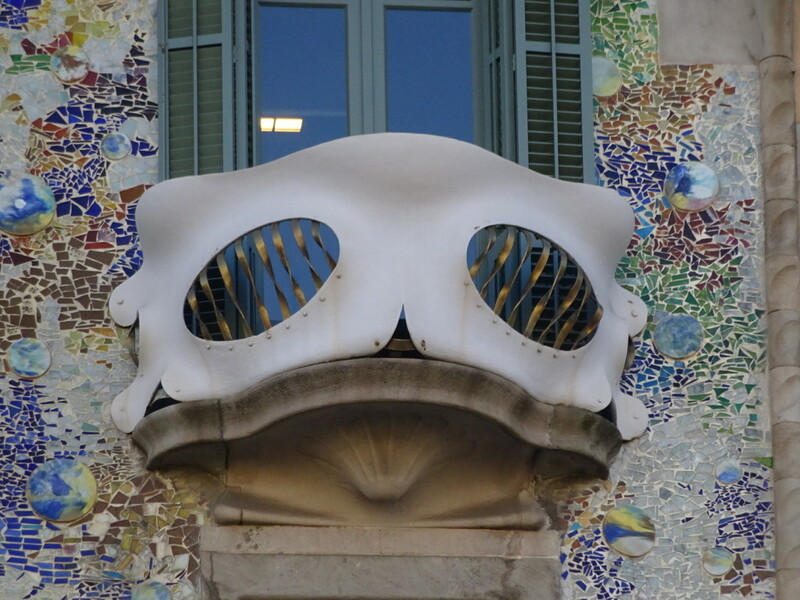 This reminds me of Tim Burton’s Nightmare Before Christmas…wonder if he was inspired by Gaudi? 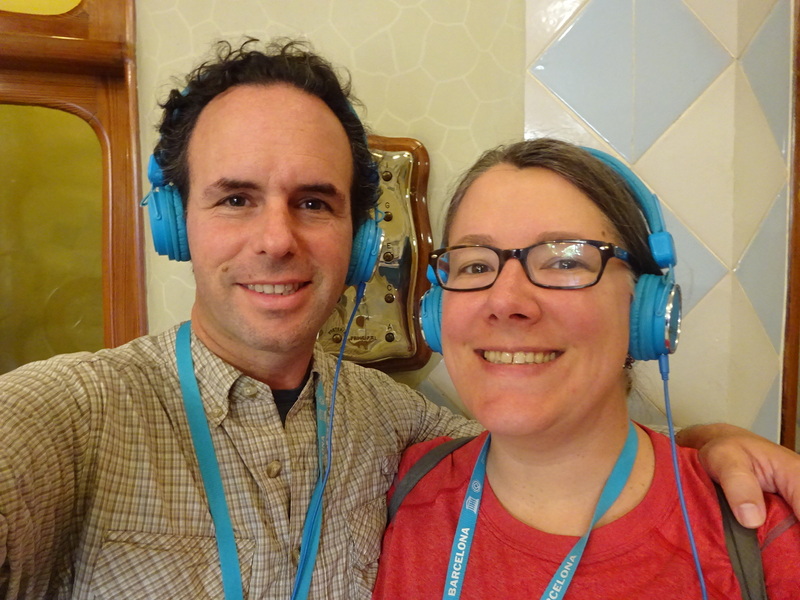 They offered a free audio tour which was really worth it! Made for such a nice fashion statement along with all the info we learned. Bright blue is really our color! 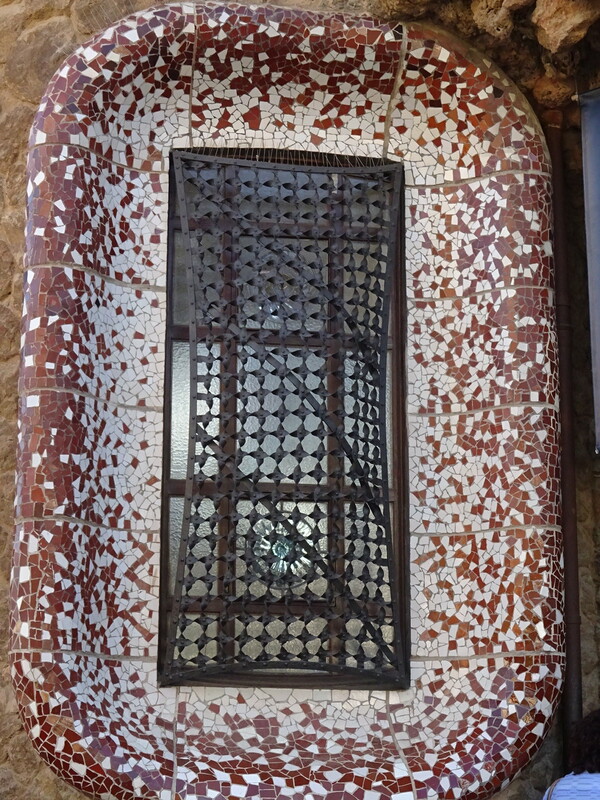 The house is centered around a “light well”. Being five stories and without much in the way of electricity when it was built, this was intended to let the sun reach the lower floors. Back in the day light wells were usually uninteresting and yucky – not really designed for viewing, just to let light in. Lots of houses tossed trash there! 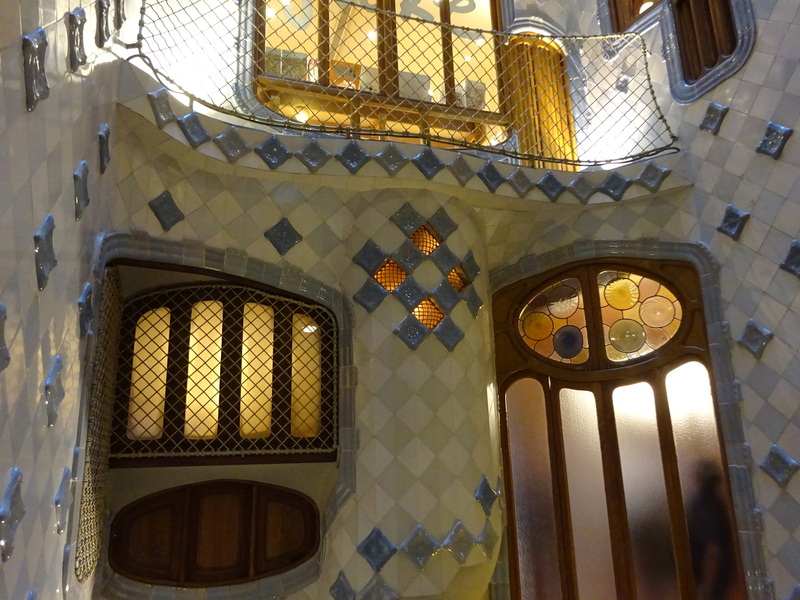 Not only did Gaudi make this area bright and airy, he actually changed the color of the tiles going down the center of the house to maximize light in the darkest parts of the home. The interior of the house is tiled in shades of pale gray to deep blue which makes the most of the sunlight coming in. 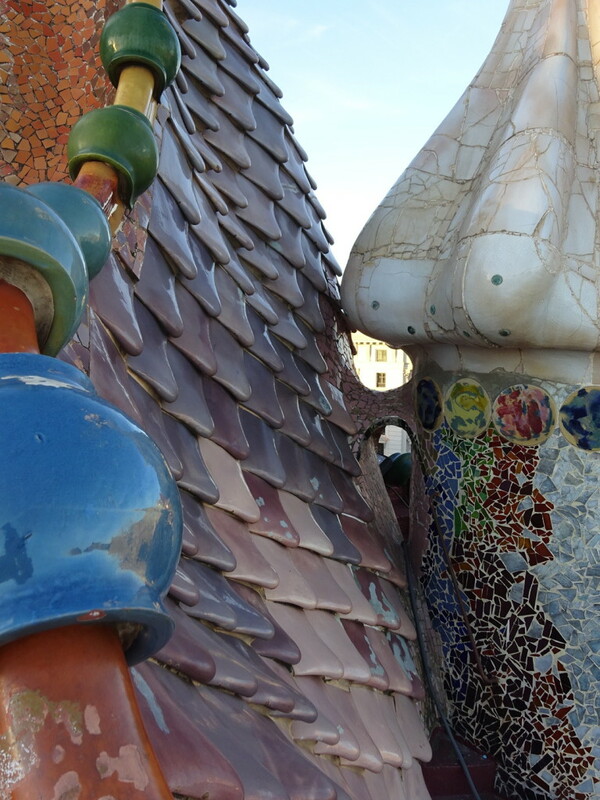 Such thought-out details were a mainstay of Gaudi’s! It’s bluer as you go up and check out how nothing is a straight line. Love that. Heading up one of the staircases in the center of the house. 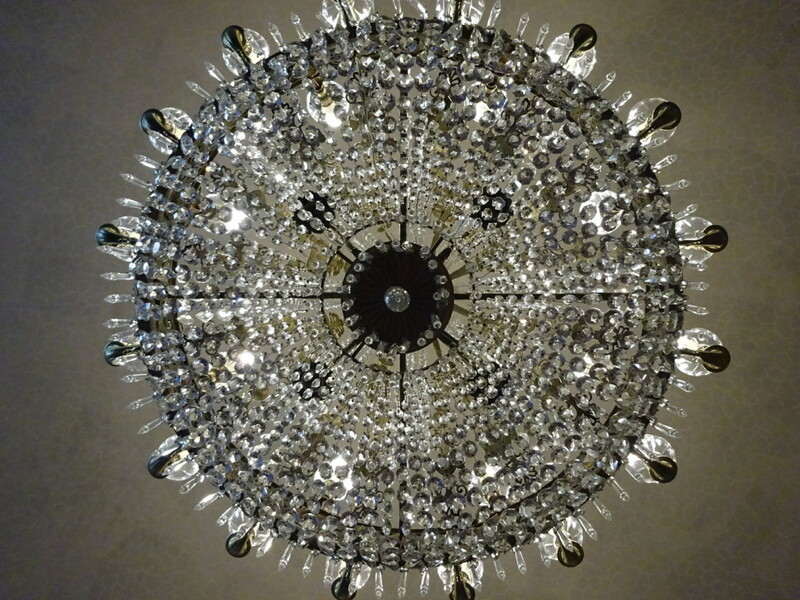 Looking up at a chandelier and the sculpted ceiling design of the entrance floor rooms – truly amazing! One of the first rooms we entered included bay windows over the street. Our cool audio tour device showed us a picture of where an altar used to be in this room. It was designed to be hidden or brought out, as needed. Seemed like every house we looked at had a chapel in it. The alter from this particular one is currently being refurbished and I think it’s going to be used in the Sagrada Familia. Nice picture window, eh? Once again, no straight lines for Gaudi. So weird being in an old house and looking outside and seeing the modern world. A close up. Looks like bottoms of bottles, doesn’t it? 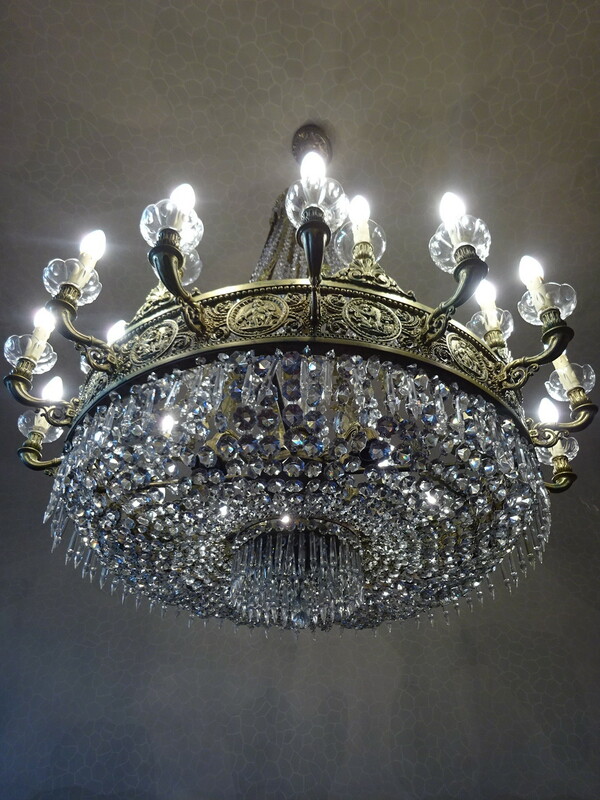 I ask you, what restoration is complete without some new light fixtures? 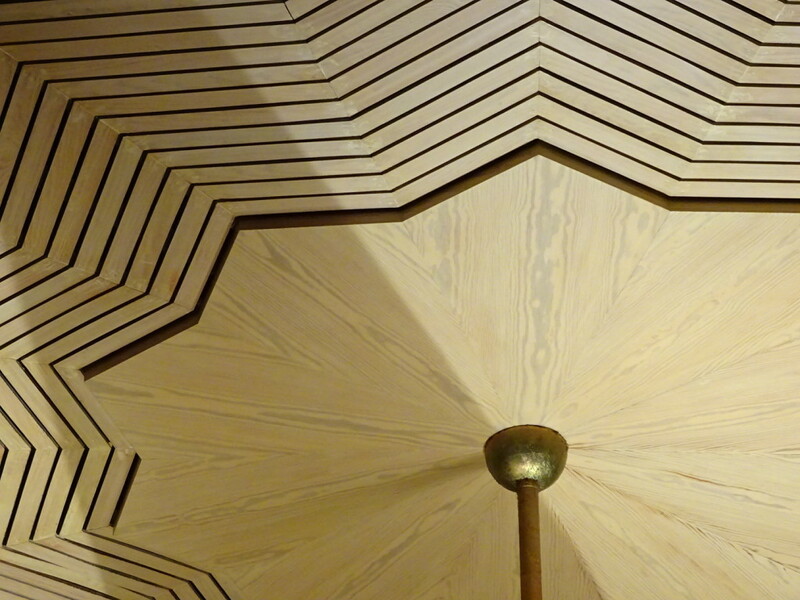 Love the patterns from directly below the light. 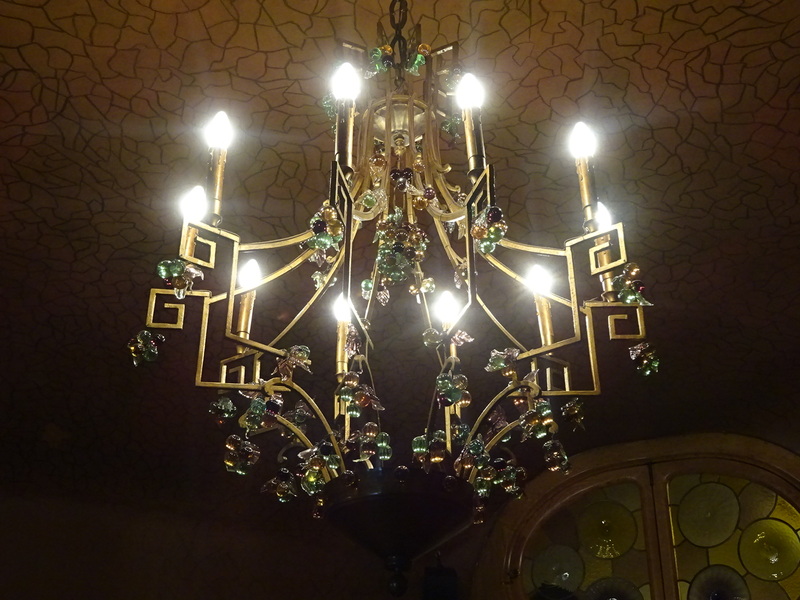 Yes, you could indeed find Aaron crouched down under every chandelier in Barcelona. Another pretty light with frilly little fruits and leaves hanging down. This is an attic area where the staff would have done chores like wash clothes. The curves allowed for more usable space than traditional design and the windows are designed to let in more light than an attic would normally have – making all of this a more useable and nicer space. Gaudi’s stuff seems crazy, but really he was all about making things useable and amazing at the same time. Now, up to the roof!! Let no detail be left unimagined. I love the roof! I mean, really?! Look at that! These are chimneys lined up and decorated. Normally chimneys were an after-thought, just popping through the roof wherever they landed. 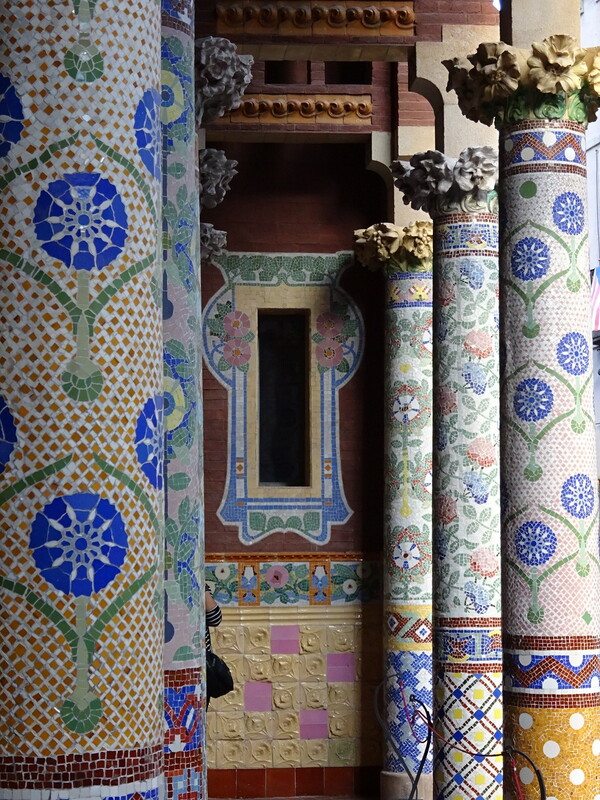 Gaudi went to great pains to specifically locate every detail of the house including the chimney placements. You always find them lined up and decorated. 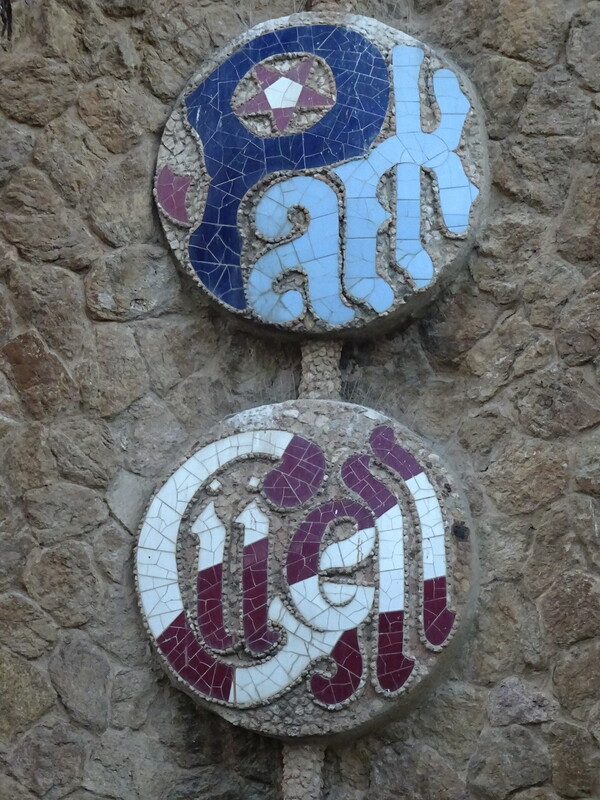 We would see this on every Gaudi house we visited or walked past. Onward! Time to head outside to another of Gaudi’s masterpieces. 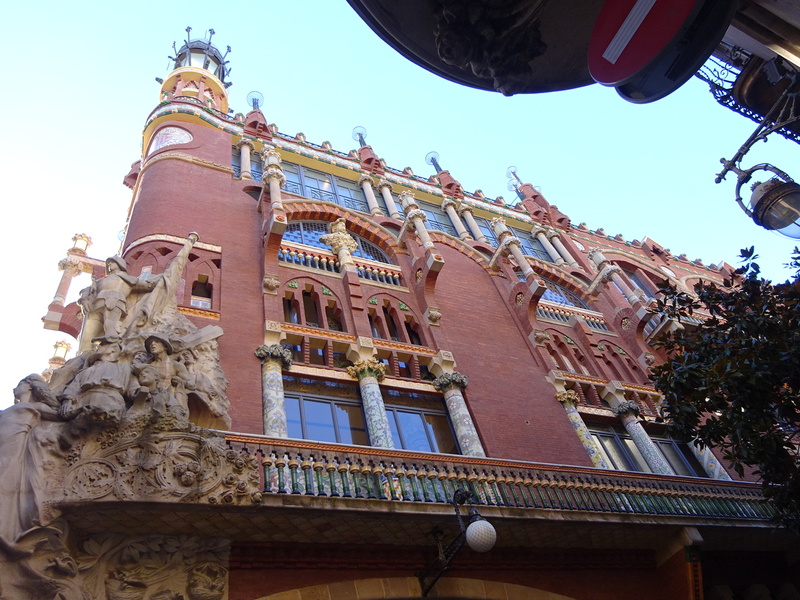 Back in the late 1800’s, Count Guell was one of the super-rich. 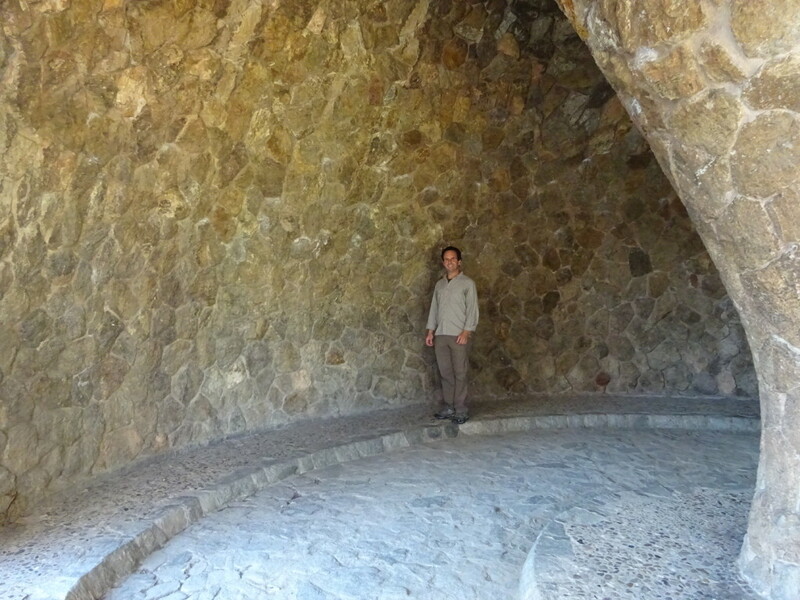 He would repeatedly commission Gaudi to design his homes and real estate ventures, including what would become Park Guell. The Count’s original intent was to create a really cool housing development overlooking the city for Barcelona’s well-to-do, but that never quite took off. 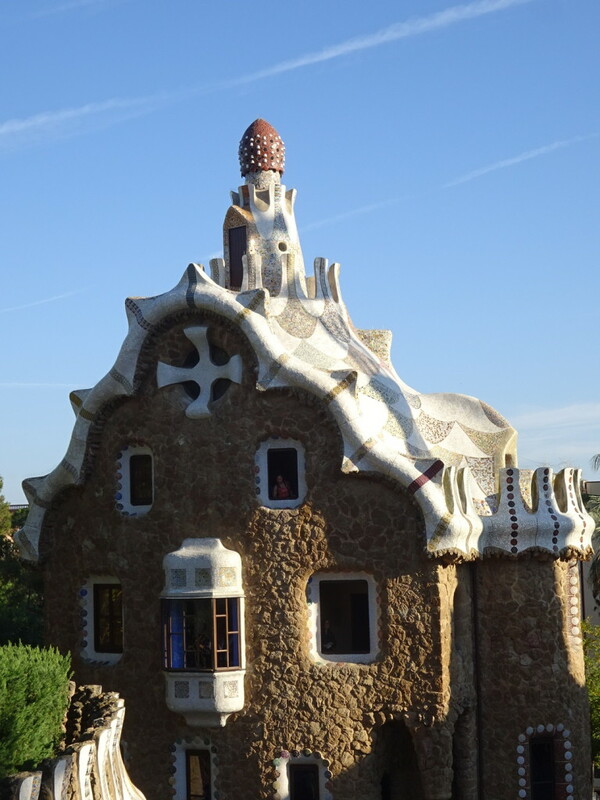 Only two houses were built and they were not even designed by Gaudi, although Gaudi and his family did end up living in one of them for a time while designing the terraces and monuments that throngs of people now come to see. 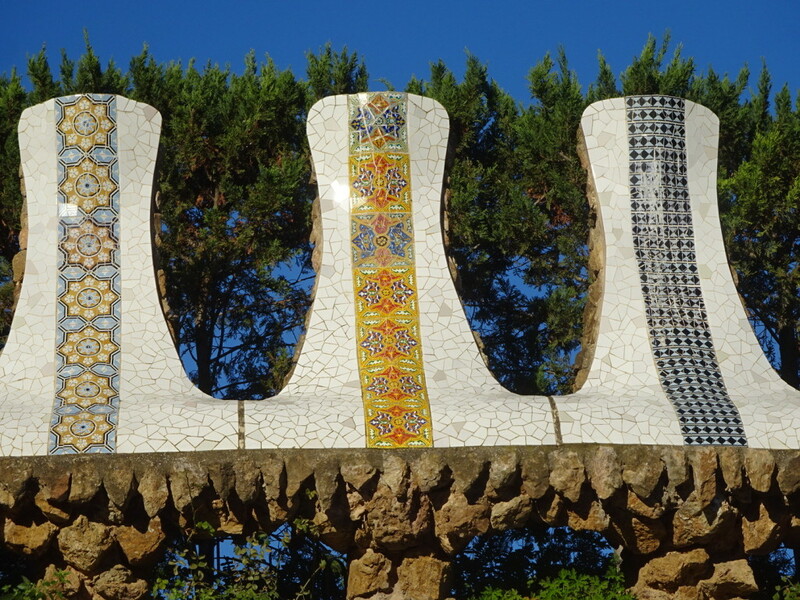 The park is covered in mosaic monuments and is nothing less than a feast for the eyes! Hope you like mosaic because it’s on EVERYTHING! The Mediterannean Sea may lie in the distant background, but I think everything looks like it belongs in Disney World. See? It all looks “gingerbready” to me, like a wicked witch is about to invite me in. Nice enough window for ya? Aaron inside the park where there was a cavernous area. Yep, quick-dry clothing blending right in! Found this little lady along a series of columns under a terrace. 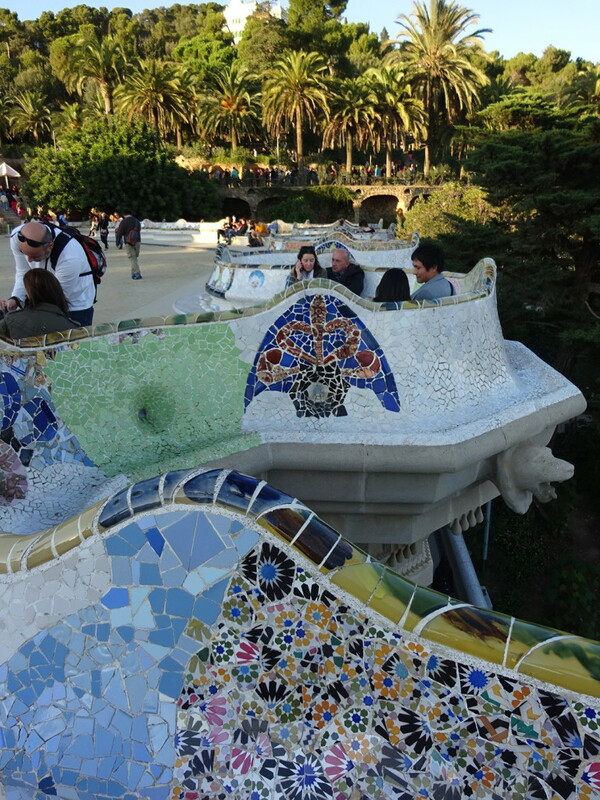 The famous Park Guell benches. Maybe it should really be just “bench” as it winds it’s way around this huge courtyard overlooking the city. 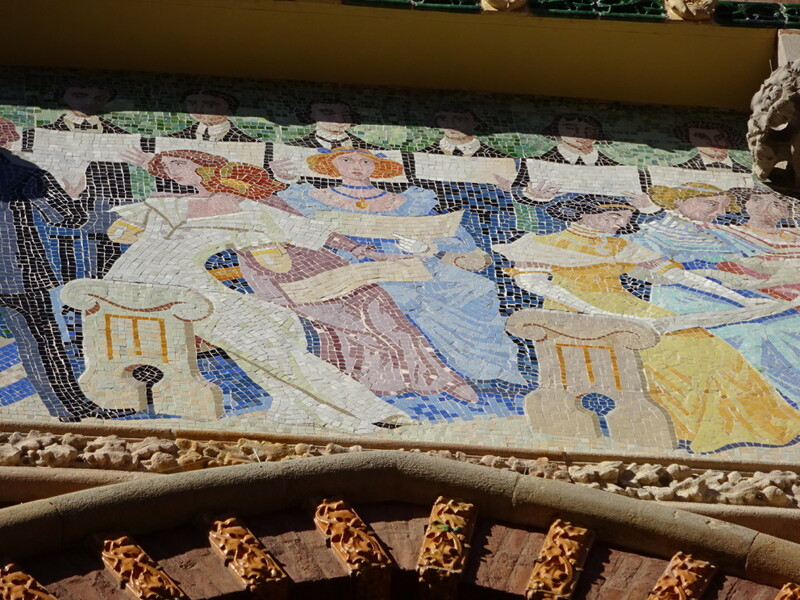 And the whole thing is mosaiced…on both sides! Example of some of the crazy monuments. 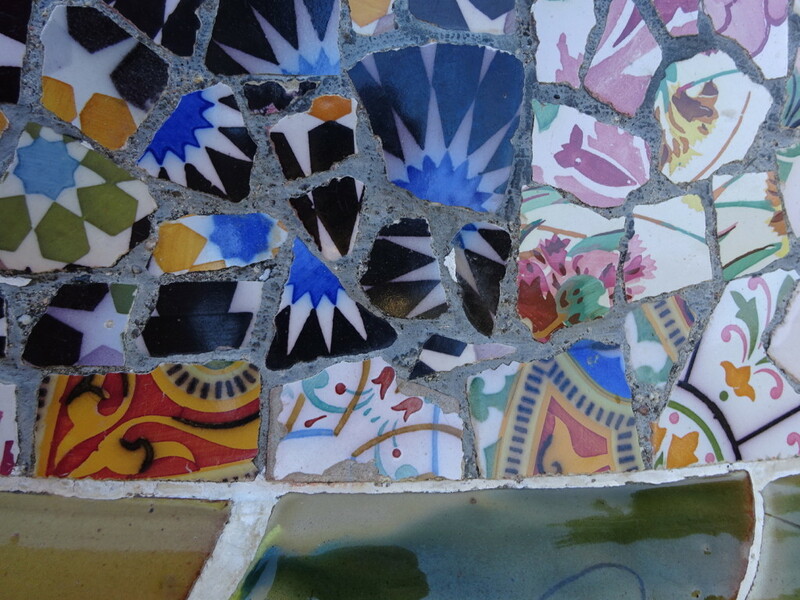 A little close-up to get an appreciation for how many little mosaics it takes to make one Park Guell. Everyone loves a mosaic! Aaron’s mom shows us just how much. 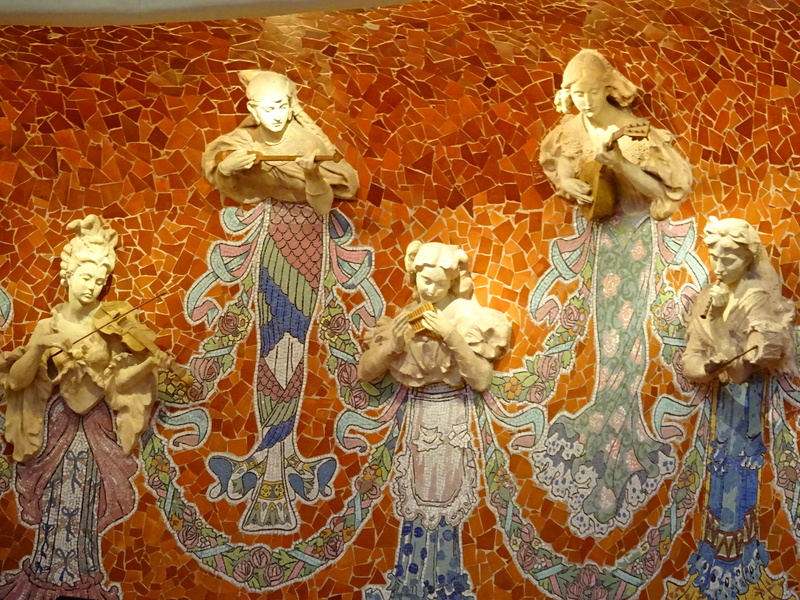 One of the first collaborations between Guadi and Guell was this mansion for the Count and his family of 10 children. It looks so much different than all the other Gaudi houses we saw, I guess because it was so early in his career. 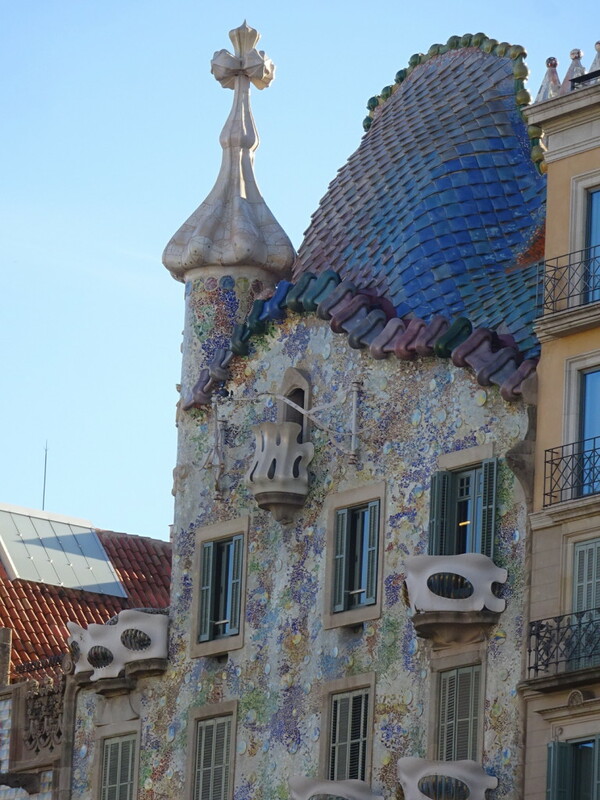 Neat seeing Gaudi’s work in different locations to really learn how his tastes and design sense developed! 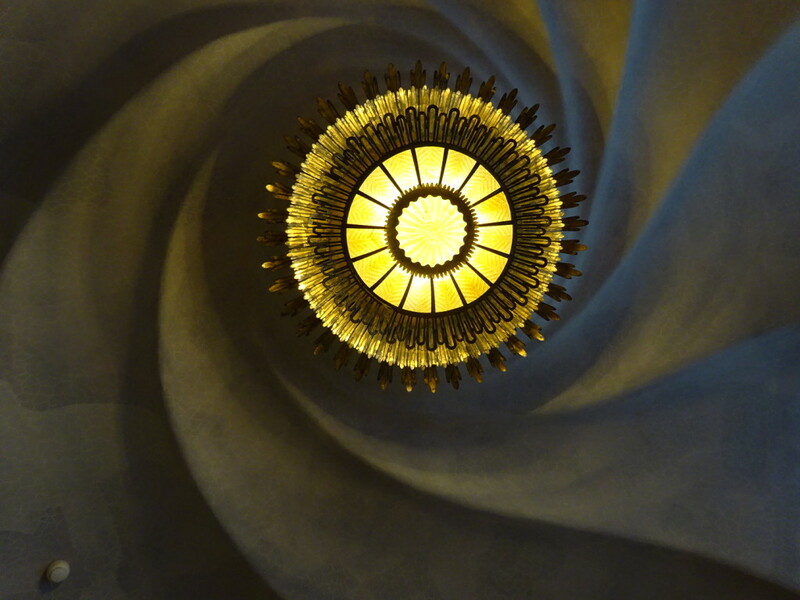 The view from the chapel/music room looking straight up the light well. 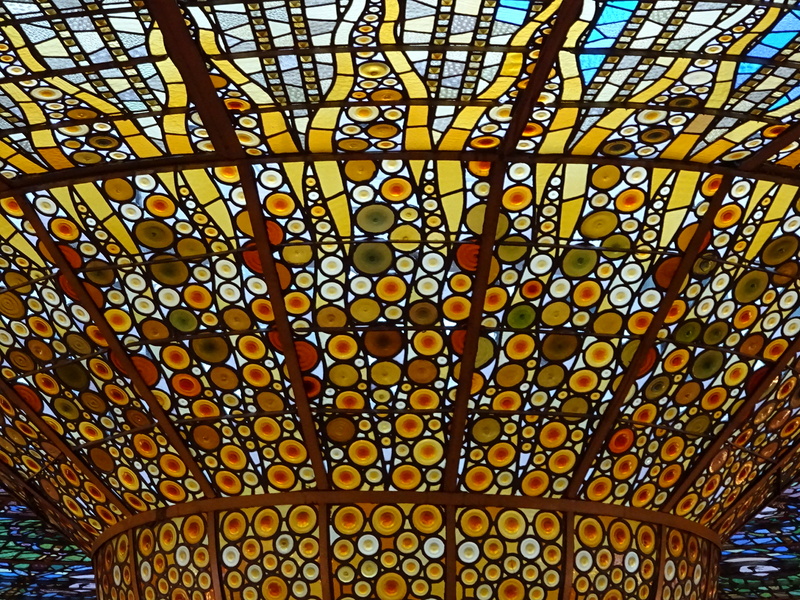 Always with the cool patterns, Gaudi. MORE patterns. 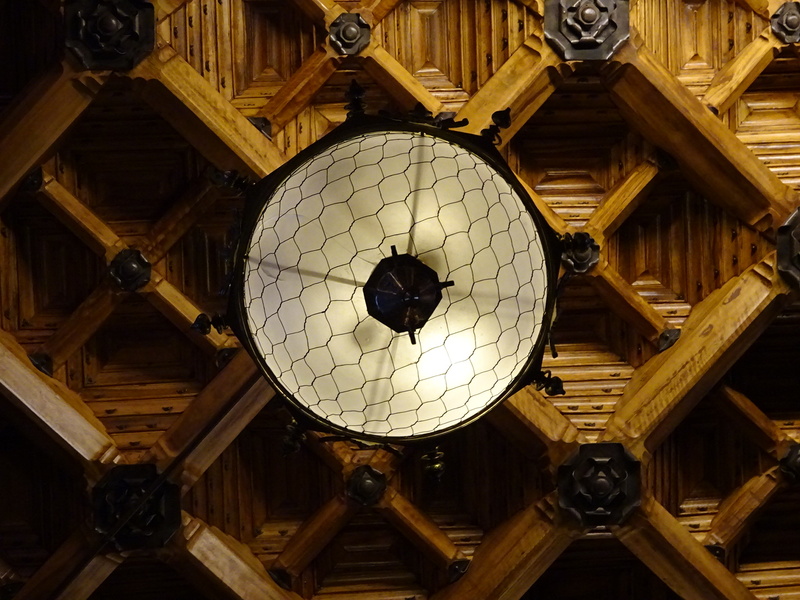 That’s a light fixture on a carved wood ceiling. During our tour the organ was demonstrated for us. 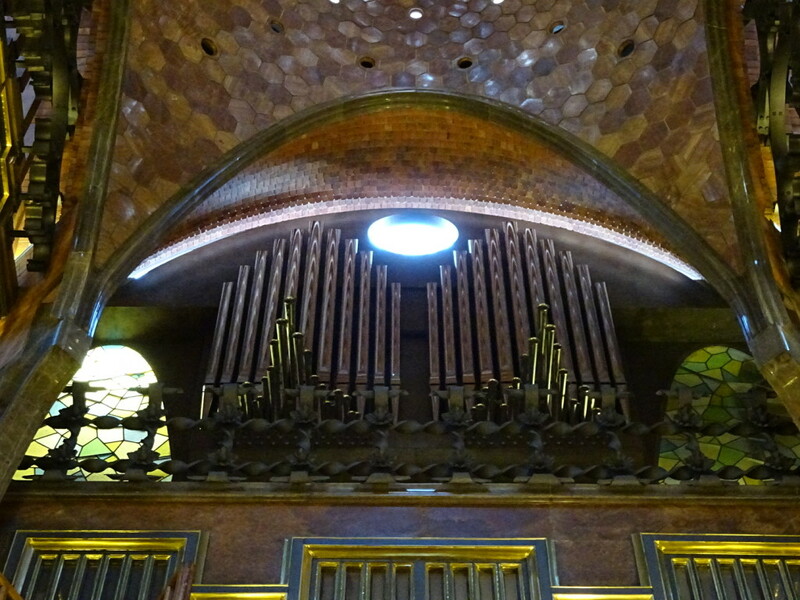 Yes, that’s right, the house had it’s own organ – and it sounded awesome! 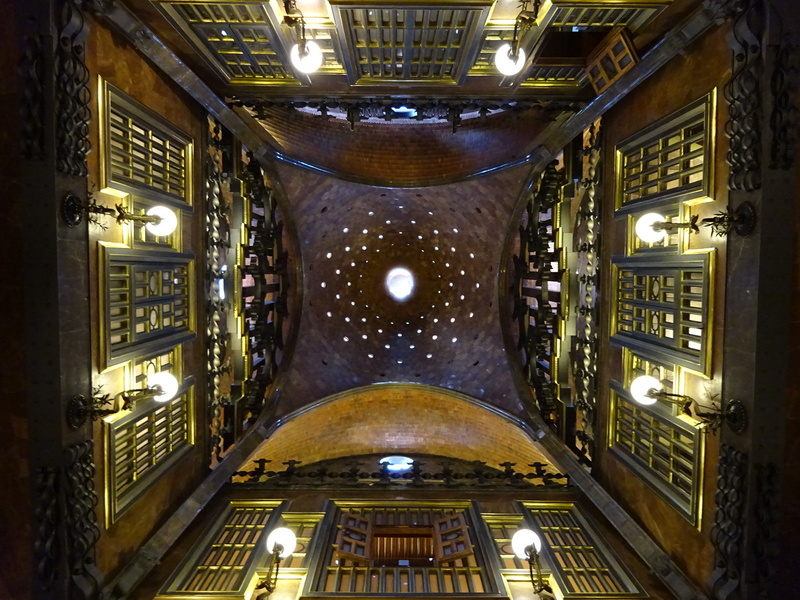 Finally, let’s work our way over to the Palau de la Musica Catalana, or just “The Palau”. This one’s not Gaudi, but it’s incredible all the same. 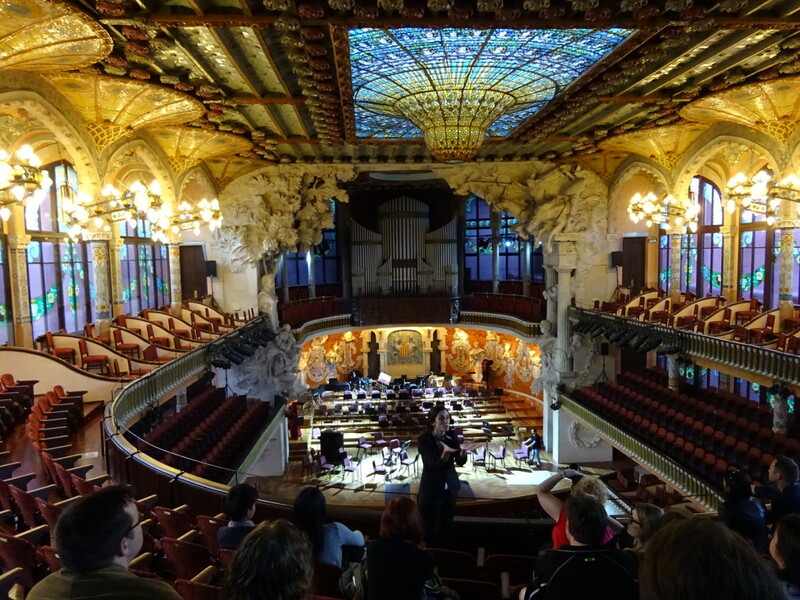 It was designed by Montaner and is home to the “Orfeo Catala” (um, a choir). Essentially it’s a glass concert hall. You read that right, GLASS! It was built about a century ago by the people for the people. Apparently choir was really big about 100 years ago and Barcelona had oodles of amatuer choirs. All the factories had their own from among their workers. Can you imagine? Factory choirs! People wanted a spectacular place to perform so they raised money themselves and built the Palau! It continues to be used for all types of music: rock and roll, jazz, orchestra, voice. I’ve never seen anything like it! 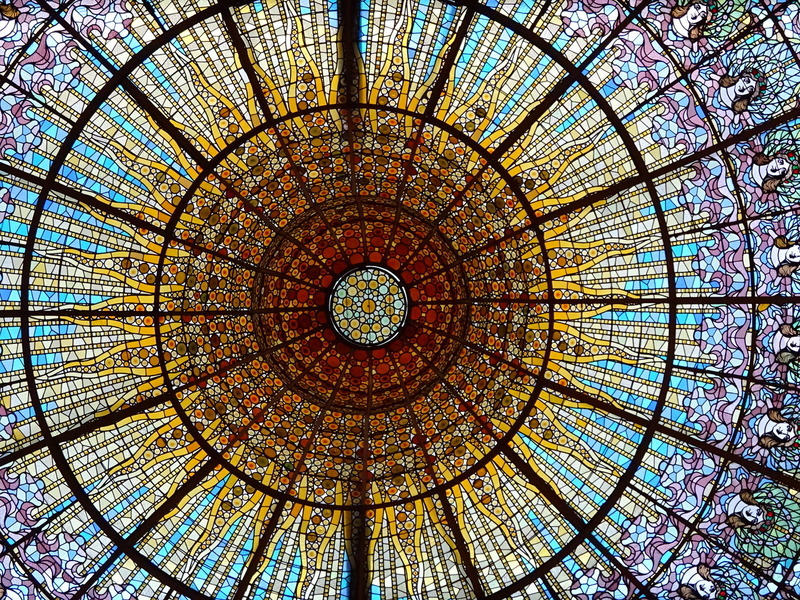 This is the iconic glass bubble in the concert hall ceiling. 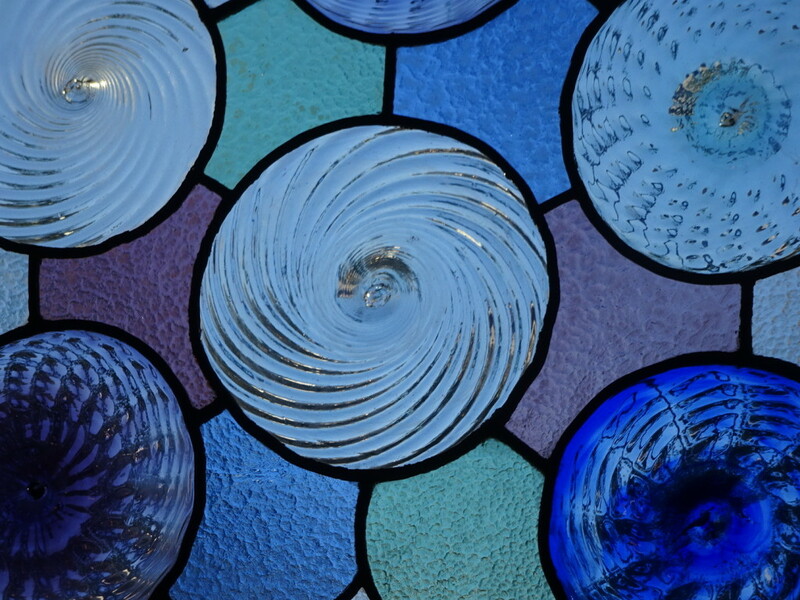 All the glass work is just incredible. More pictures in just a second, but first let’s look outside. Just approaching the outside of the Palau you know you’re somewhere special. 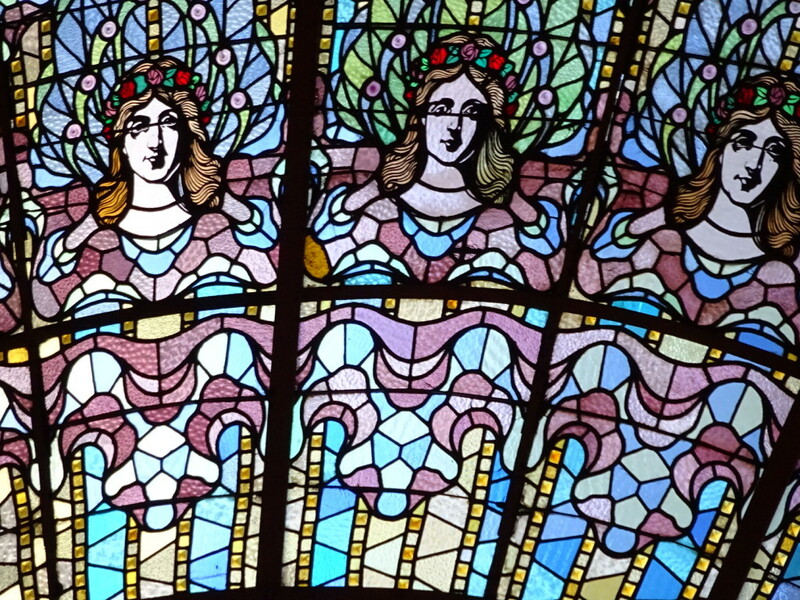 Gorgeous mosaics and carvings adorn the building. 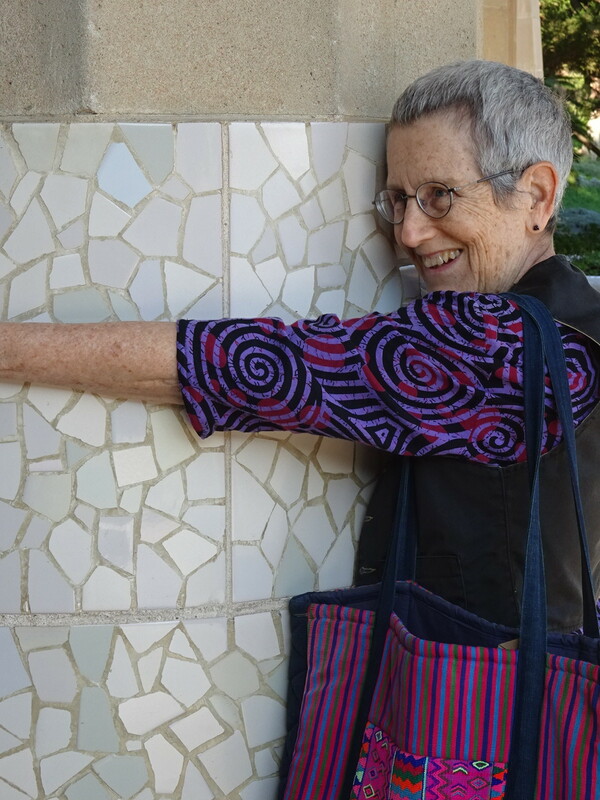 The Palau made me want to tile my entire house! This is the balcony and you’ll see this scene on postcards around the city. Inside it’s patterns, patterns, patterns. 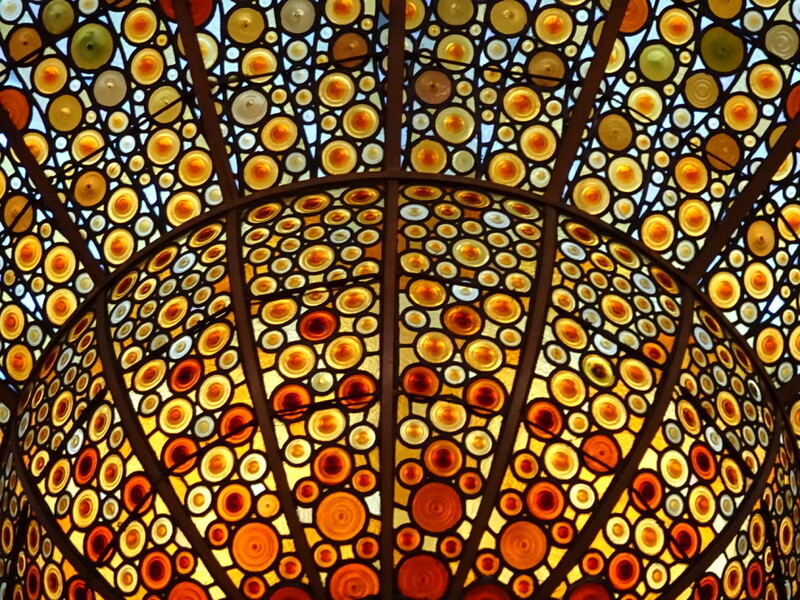 This is the top of a chandelier. 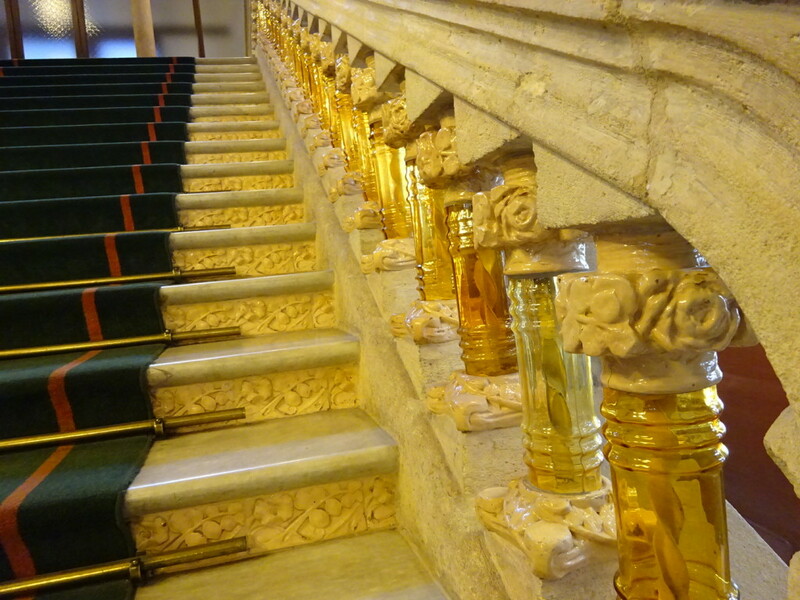 The stair rails have these wonderful colored glass cylinders. 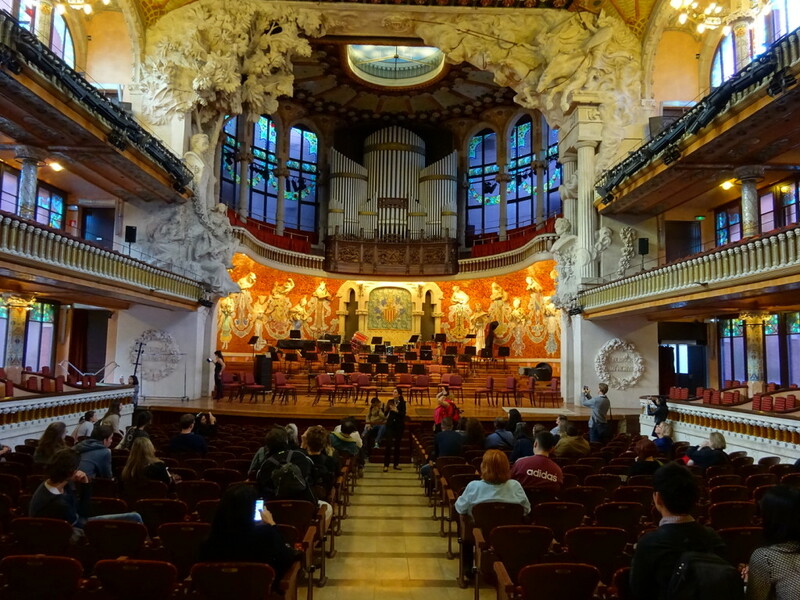 And THIS is the concert hall. The thing to remember is that it’s all glass! A glass concert hall. I still can’t believe that part. The sides are glass and so is the ceiling. This gives you an idea of how the glass bubble looks in the concert hall. And let me just say this: two TONS. That’s right, two tons is how much the bubble weighs! How’s that for an engineering marvel floating overhead??? The organ! It took a long time to raise the money to restore this after it fell into disrepair, but it’s absolutely fantastic! 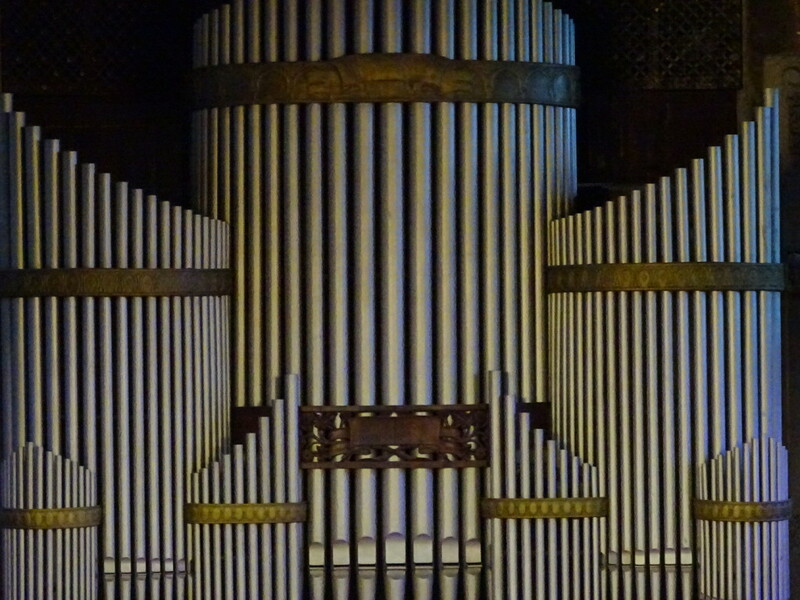 They have it set up to play automatically when there’s a tour so that guests can take in the concert hall in all its majesty…but the playing also keeps the organ pipes up and running. Win-win! Not too shabby, eh? Did you notice the pale blue circular area on the roof near the beginning? That’s a glass balcony where the conductor (who lives up there!!!) and his family could watch the performances. It was originally open but has now been covered with clear glass for safety and to improve the acoustics even more! My favorite part of the whole tour: On stage, these sculpted women “play” music along with the musicians. I think they are magical and really loved this element. 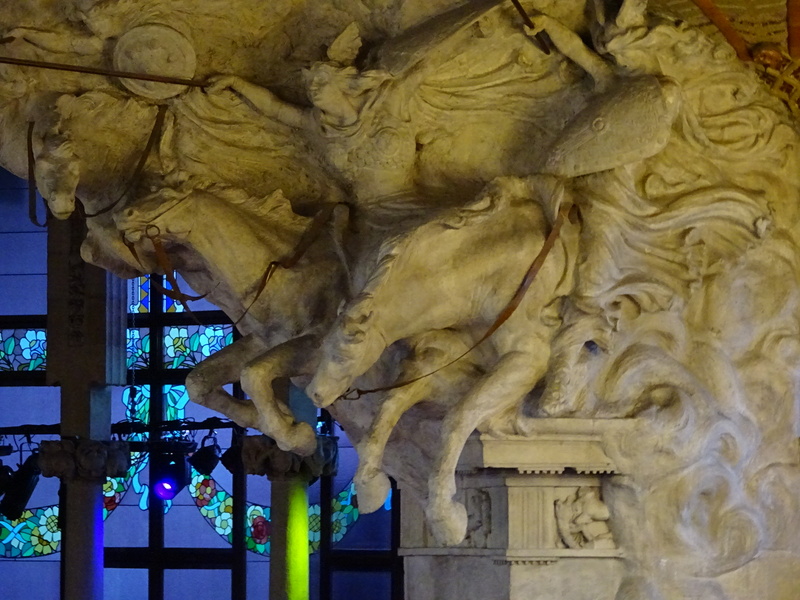 Horses galloping to the music up in the balconies. In the few places where there’s no glass, there’s mosaic. The tile around the top honors all the great composers. Oh I love this! I really love the colors as much as the pattern. 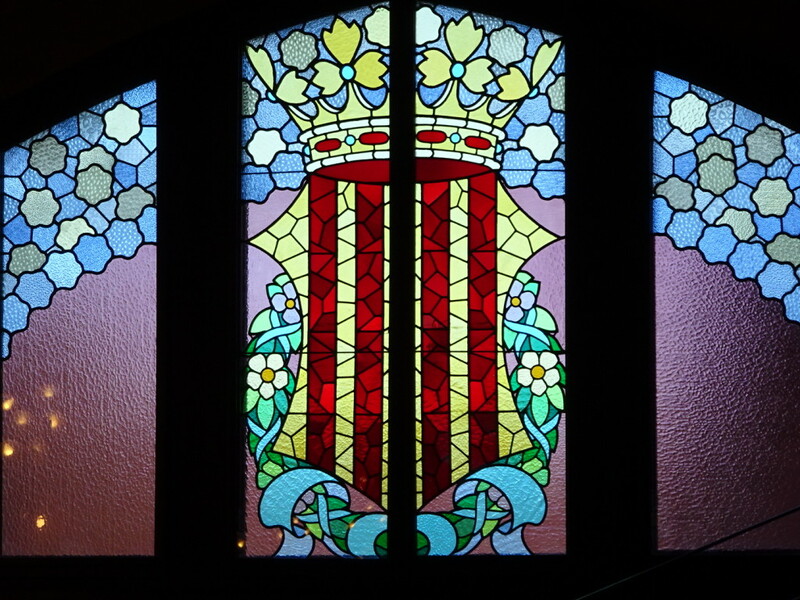 One of the windows to the outside with a family crest. 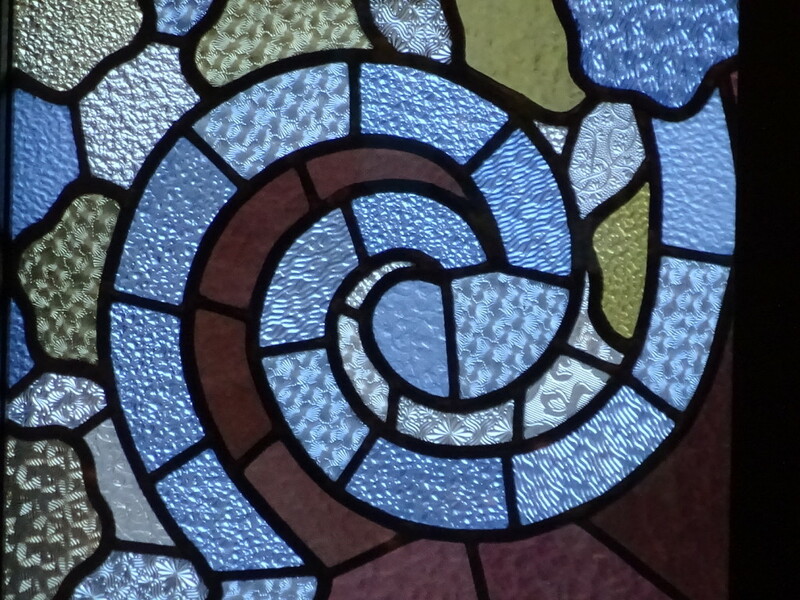 Not Gaudi, but lovely swirls nonetheless! Came across this on one of the streets of Barcelona. Maybe it was by Chok, I really don’t remember, but with such tasty subject matter you know we had to include it. That brings us to the end of our tour. Hope you enjoyed it! 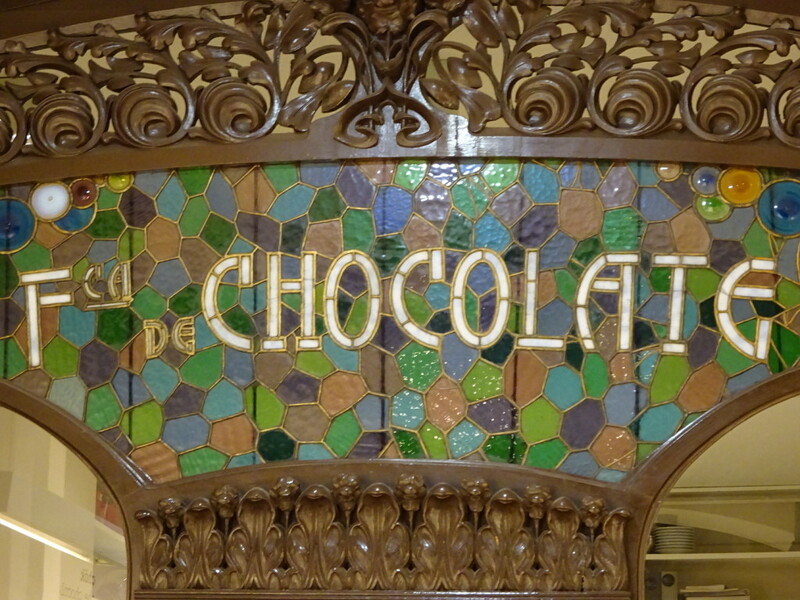 We truly fell in love with Gaudi and the Art Nouveau works we found around Barcelona. How about you? Wow, Anner and Aaron! You two are amazing, sharing all this with us. I love, love, love your postings. Thank you both!!! Hi Pat! Thanks for following along. I hope you and all our readers know just how much we enjoy sharing this experience. The blog has made it even more fun, if that’s possible! Thanks Andrea, and happy birhtday to you as well!! We can have a big belated bday celebration when we return in just a couple of weeks!! Wow everyone of those pictures where beautiful to look at and great to see Deb as part of them. Aaron gets most of the photo credits and it’s hard to go wrong in Barcelona. There was just so much beauty everywhere we looked. I have added this to places I want to visit. So cool! Always happy to add to people’s bucket lists! Thank you for sharing! These–as are all your posts–are quite amazing! I’m very curious to see how all these experiences shape Aaron’s artistic visions for his jewelry-work. 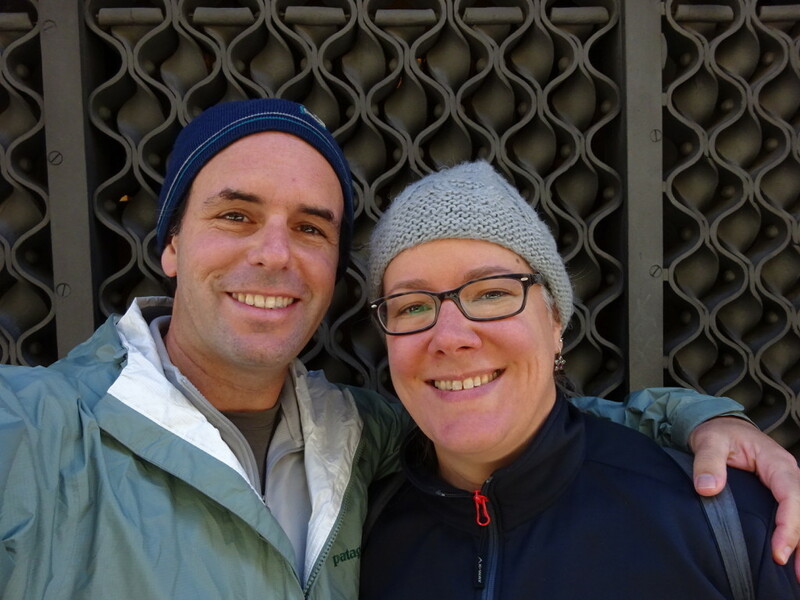 Continued safe travels to you both! Thanks, Retsu! After all our travels I find myself looking away from jewelry a bit and towards some other art forms, particularly sculpture. All the things we’ve seen and experienced are DEFINITELY going to make an impact on my work. On Feb. 4th we’re back in Seattle where hopefully I’ll be putting things into action soon! That’s great! Jewelry is small wearable sculptures after all, so I can see how your “vocabulary” could transform to larger pieces as your ideas and inspirations evolve. I hope the rest of your travels as you head home are smooth and enjoyable! Enjoy Beantown! Okay, I surrender. 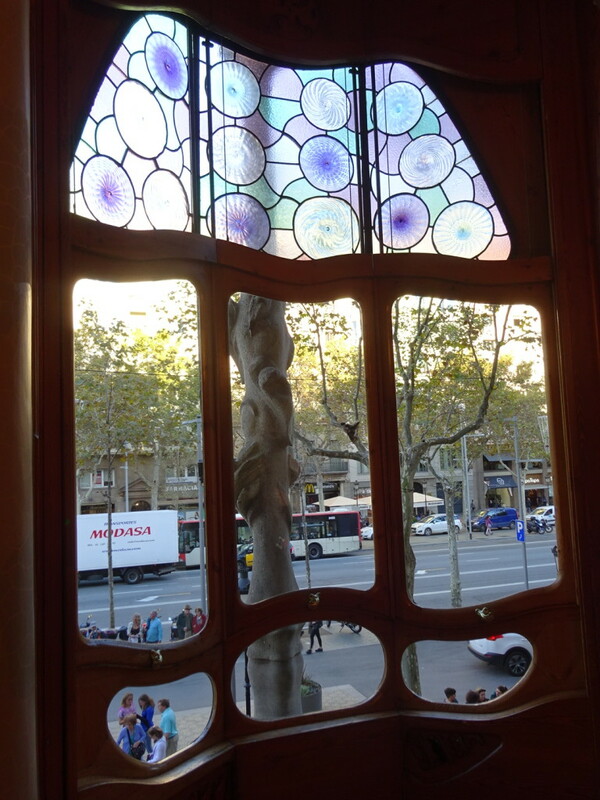 Gaudi is still a bit gaudy, but you have made me re-think my feelings about his art. Thank you for educating me. I stand (well, sit actually) corrected. Points awarded. Ohhh, we do love our points, yes indeedy! 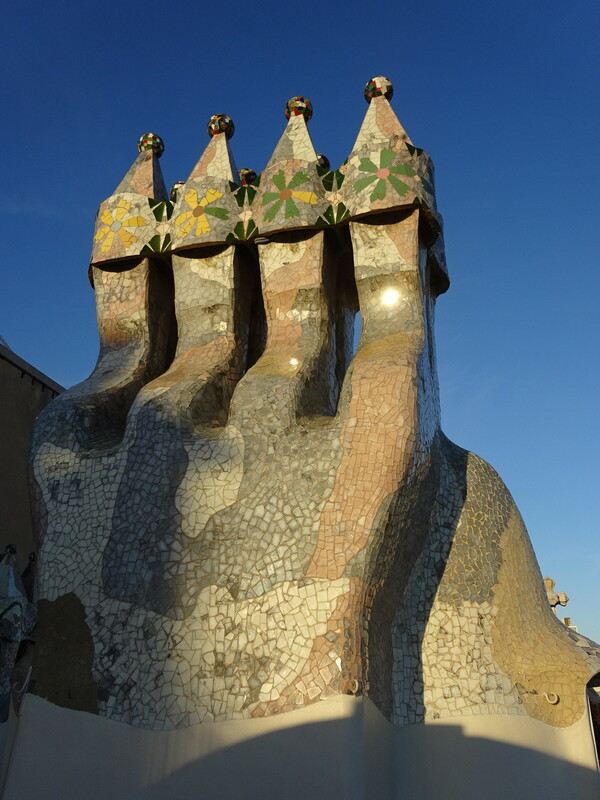 Glad we’re spreading the Gaudi-inspiration.